The Shining is undoubtedly one of the creepiest and most controversial horror movies ever made. It is well-documented that Shining author Stephen King actually said that Stanley Kubrick's film adaptation was not a good one and that it's the only adaptation of one of his novels that he could "remember hating." Now enter Room 237, a new documentary that examines the cult of The Shining and depicts just how crazy it has drives critics, even 32 years later. 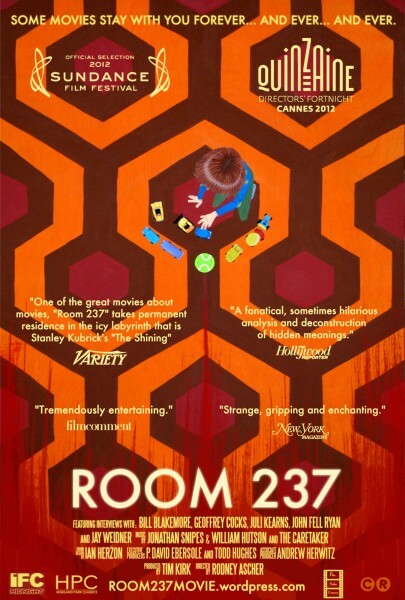 But Rodney Ascher's Room 237 also utilizes Kubrick's film as a basis to examine film critique, and the tendency of critics to add meaning, decipher subtext and interpret clues where there may be none. This flick has been picking up a lot of buzz, and it should be especially fun since Kubrick (1928-1999) was notorious for his long shoots and perfectionism, and has been the focus of much critical ink. The embedded trailer doesn't clue us in much on what the film includes other than its rave reviews, but we're liking what we are seeing - the poster (rocking the Overlook Hotel's carpet pattern) is pretty cool too.